How can local TV news end the shutdown? There would never have been a shutdown if local TV reporters had done their job. Their job is simple: hold THEIR members of Congress accountable. Ask them questions. 1. Experts agree a wall across the entire border is a waste of tax money, so what's your position? And on what evidence do you base your position? 2. It is well documented that many of things Donald Trump says about the wall are not true. Why don't you object to the President lying? If local reporters held their members of Congress accountable, we wouldn't have such a dysfunctional Congress. Now, the member is able to say nothing, to be silent, and is able to refuse comment with immunity because the member isn't held accountable locally. 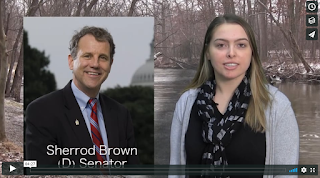 In my computer-assisted reporting class a couple years ago, each student was assigned a member of the Ohio Congressional delegation, and had to get the member's position on climate change. You can see what they said on the Congressional Climate Change Reporting Project. No surprise, most members would not even respond. They know there's no penalty with local voters. There's one question after another local TV reporters SHOULD be asking their members of Congress on issue after issue. Why don't they? Please, write to the GM's of your local TV stations and ask them to go on the evening newscast and explain. If members of Congress were held accountable by local reporters so voters could see and hear what they say, there would have been no shutdown. The members would have been forced into answering questions and to provide facts that support their positions. Unfortunately, the corporate owners of local TV stations don't care about the country or democracy. If they did, their local newsroom reporters would be questioning their members of Congress on issue after issue on a regular basis. Thanks to technology, it's not even expensive. Thanks to videoSkype and Facetime, the reporter in any local newsroom can do an on-camera interview with the member in her/his Washington office. Please, demand accountability from your local TV stations. It's not the fault of the reporters they're not questioning their members of Congress. There is only one requirement for a newsroom to hold members of Congress and the state legislature accountable on important issues: a commitment from management. Local TV stations make millions from political advertising. They spend virtually nothing covering their members of Congress or the legislature. Why do you think it was so easy for legislatures in state after state to pass laws to restrict voting? The answer: zero oversight by local TV stations. One the finest journalists in the country, Charles Lewis (former 60 Minutes producer, founder of the Center for Public Integrity, director of the Investigative Reporting Workshop at American University) describes the problem. KI Note: I haven't been writing here for quite some time. 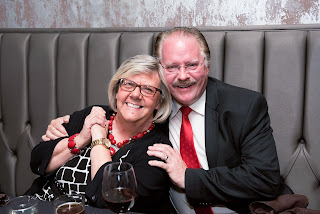 I dedicated last year to taking care of my wonderful wife Kathy who died in the arms of her children with her son holding her from one side and her daughter holding her from the other and me on the phone asking for a Hospice nurse as Kath lost her battle to cancer last September. Hospice people are the most wonderful people. Thank you Hospice. Hey Morning Joe - Apologize! Every television executive in America should be watching what Channel 4 in the UK has done: journalism. Every television news executive at every local TV station in America should ask themselves one question: why doesn't our station hold our members of Congress accountable on anything? And if you want to find out what your member of Congress thinks of what Cambridge Analytica has done, you'll have to call your member of Congress. Most likely, your local TV reporters never will. When journalism fails, bad things happen. That's why we had a war in Iraq. There was no imminent threat. Hans Blick's weapons inspectors all found the same thing: nothing here. Unfortunately, journalists didn't do their job. They played cheerleader. Channel 4 in the UK is doing what journalists are supposed to do: journalism. The best thing about the election of Donald Trump is it has prompted both the New York Times and the Washington Post to do journalism again. That's essential for democracy. The threat to democracy does not come from terrorism. Terrorists don't have a chance at destroying democracy. The threat from democracy comes from government secrecy combined with corporate greed combined with the failure of the press to do its job. When journalism fails, bad things happen. That's why Trump is president. Remember when Morning Joe did nothing but play cheerleader for Trump? Now the show is critical and questioning. Too late. Hey Morning Joe, you need to apologize. I'm watching MSNBC. It's acting with disbelief, shock and revulsion at the process a woman must go through to file a sexual harassment complaint in the House of Representatives. What it should be asking is where was the Washington Press Corps? How in the world does this system get put in place, stay there for years, and not be questioned by the Washington press corps? Come on MSNBC. Try this. Instead of just putting people in the studio and letting them yack, spend a few dollars to have people do some reporting. Go question Washington press corps reporters. Ask them why they haven't done this story years ago. And here's a super easy story for any MSNBC program. Ask the head of NBC news to come on your show and explain why the network has never done an in-depth piece of reporting on climate change, racism, sexual harassment, our wars, money in politics or any other substantive issue facing the country. Terrorists don't have a chance at destroying democracy. Three things do: government secrecy, corporate greed and the failure of the press to do its job. All three have been running full speed for years. We had a war in Iraq because American journalism failed. Donald Trump is president for the same reason. Senator Al Franken apologizes for doing something despicable. When will MSNBC? During the primaries Morning Joe should have been called Morning Trump. The show just turned its airwaves over to him. Isn't it time to apologize Joe? There's a government agency that has done fabulous work not on behalf of corporate lobbyists or the big banks or even the pharmaceutical industry. It's an agency that has done fabulous work to help the average citizen. It's the Consumer Financial Protection Bureau. The New York Times piece indicates the agency has done such fabulous work, it might be too difficult for Republicans to kill it. Republicans have opposed the agency since its creation during the Obama Administration. For some, the fact it was created by the Obama Administration may be reason enough alone to oppose it. But this agency and your member's support or opposition provides a quick test you can apply to your local television station. Have your local TV reporters questioned their members of Congress where they stand on the Consumer Financial Protection Bureau? If your local TV reporters haven't ever questioned their members of Congress, it's a good indication that the corporate owner of your local TV station doesn't care about you, your community, or the rights of consumers. Like many, they only care about maximizing revenue. Any news organization that's actually concerned about democracy and solid journalism, would be questioning their members of Congress. What are your local TV reporters doing? Remember, if they're not questioning their members of Congress it's not their fault. The fault lies with corporate management. Terrorists don't have a chance to destroy democracy. Three things do: government secrecy combined with corporate greed combined with the failure of the press to do its job. When journalism fails, bad things happen. It is brain-smash (football) season again. When do you think universities will recognize what medical science has discovered and do something about brain-smash season? When do you think a president of a university will object to a sport that causes brain damage? When I was a kid, you could page through a magazine and find an ad featuring a doctor telling you what cigarette to smoke. What fabulous health advice. 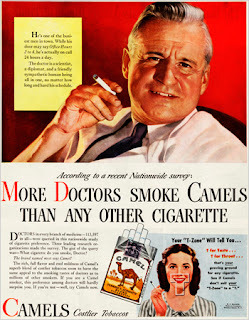 Apparently, if the ad is true, a whole lot of doctors liked Camels. Don't you wonder how many of them got lung cancer? But doctors' behavior changed. With smoking, oh oh, along came medical science. Ah yes. Facts. Substantive scientific research. Turns out the ads urging people to smoke weren't good for your health, just for the tobacco companies' bottom line. (Now tobacco companies target poor people in Africa) Journalists reported what the scientists had found. This was IMPORTANT public health news. The public was informed. Behavior changed. With football concussions, medical science came along again. But this time, reporters for the most part didn't report. They just waved their pom poms and played college cheerleader. It took a movie starring Will Smith to inform the public. What do university presidents say when questioned by reporters about football concussions? 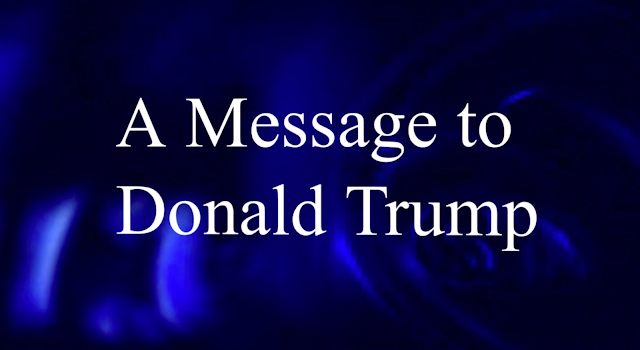 Here's a video clip that answers that question. Reporters aren't questioning their university presidents about why the university continues to support a sport that causes brain damage. How come? Is it possibly because Brain Smash is still America's favorite game and a big revenue producer for television? At most universities, Brain Smash loses millions each year. This clip is three years old, but profit/loss numbers still show most schools losing. What will it take for a university president or the head of a university medical school or a provost or a dean to speak up? More brain damage? More lawsuits? One thing is certain: mothers will take care of it. Moms who put helmets on their toddlers before they let the kids ride their trikes aren't about to let them play football. They know what Vince Lombardi knew. He didn't call football a contact sport, he described it as a "collision" sport. Mothers are concerned about their child's brain. University presidents aren't. If you meet a university president, ask why. You'll have to ask why. The press isn't. Yes, newsrooms are under increasing pressure. Staffs have been cut. Reporters have to produce tweets, Facebook posts and more stories. Reporters have less time to crank out more work. So here's an easy one. For television, reporters don't even have to leave the newsroom, just do it via Skype or Facetime. It's one question, and with the start of another football season incredibly timely. Ask your area high school principals: Why do you support a sport medical science has documented causes brain damage? Just edit their responses together, or run one each night. And be sure to feature those principals who refuse to comment. How did university presidents respond when questioned about football concussions? This video provides the answer. Note: the clip's a year old so perhaps someone has done more reporting. If so, please let me know. And here's an easy one-question story for any media critic: when it comes to sports, when will newsrooms put down their pom poms and pick up their pens? Does NBC Believe in Journalism? Does NBC believe in journalism? Megyn Kelly's interview with Alex Jones should answer the question. Journalism is about holding those with power and influence accountable. If you're not doing accountability journalism, it's not journalism. Will Megyn Kelly hold Alex Jones accountable? If she does, it can be a highly worthwhile program. If she doesn't, then NBC should simply ask the entertainment division for a laugh track to add to her show. And NBC should apologize for its lack of standards. Any citizen concerned about climate change should send three letters, three emails and make three phone calls, one each to ABC, NBC, and CBS. Ask one question: why hasn't your network ever done an in-depth piece of reporting on climate change? Report what you find on social media. 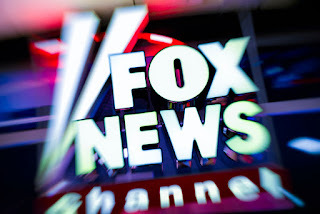 There's really no need to ask the "who do you hate today network," Fox News anything. Climate change reporting would require something that Fox News has no interest in: real reporting. Here's a great paragraph from today's New York Times article on Trump berating the media. The President needs to ask the New York Times or the Washington Post or the Guardian if he can sit in on an editorial review session for a major article so he can understand just how rigorous editorial review is. The Times and the Post and the Guardian don't just make it up. Unlike the White House, they have ethical standards. There is good reason to berate the media. The President can legitimately berate local television stations for not questioning their members of Congress about climate change. The President can legitimately berate local television stations for not asking their Republican members of Congress why the Republicans had no workable healthcare bill ready to go following years of complaining about Obamacare. The President can legitimately berate local television stations for ignoring what's happening in their state legislatures. The President can legitimately berate ABC, NBC, and CBS for never doing any in-depth reporting on climate change, healthcare, the wars, the risk of offshore oil drilling, student debt and every other major problem confronting the country. But when the President berates the media for using anonymous Washington sources, who if named would probably lose their jobs, he simply demonstrates what he's demonstrated every day of his presidency, that he does not understand how Washington works. Unfortunately, he continually demonstrates he doesn't understand that professional journalism like you see in the Washington Post and the New York Times and the Guardian is absolutely essential to a democracy. He continually attacks the primary institution required for any democracy to remain strong. 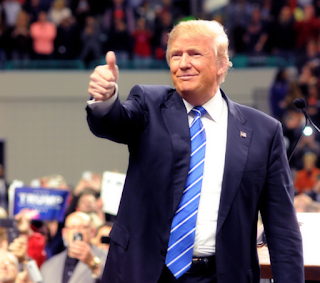 The President's insults of the media demonstrates the President is an insult to democracy. The network's biggest star is a serial harasser. What did FOX do years ago when associate producer Andrea Mackris wouldn't tolerate the harassment and filed suit? FOX paid millions to keep her quiet. at the Smoking Gun to get a true flavor of just how despicable O'Reilly's behavior is and ask one question: would any responsible corporation with any ethical standards keep Bill O'Reilly employed? No, of course not. So when FOX decides to finally fire a disgusting individual who should have been shown the door after harassing his first female victim, its memo announcing the departure of a serial sexual harasser demonstrates the leadership of the corporation has zero regard for women. ‘‘We’d like to address questions about Bill O’Reilly’s future at Fox News. After a thorough and careful review of allegations against him, the Company and Bill O’Reilly have agreed that Mr. O’Reilly will not return to the Fox News Channel. Lastly, and most importantly, we want to underscore our consistent commitment to fostering a work environment built on the values of trust and respect." FOX doesn't say one negative thing about its serial sexual harasser. That's not really surprising from a corporation where since its founding a serial sexual harasser, Roger Ailes, ran the place like it was boy's club from the 50's. What could possibly be more disgusting than the FOX statement on Bill O'Reilly? Ah, you're thinking President Trump's support of Bill O'Reilly? No, one sexual harasser supporting another is not disgusting; it's just the state of affairs in America in 2017. What's more disgusting than FOX's statement is Bill O'Reilly's. Nobody pays millions to settle allegations that are totally unfounded. It does, however, make sense that the number one anchor on the network that has demonstrated since its founding absolutely no regard for the profession of journalism, that its main star attraction would put a bold face lie in his closing statement. FOX and Bill O'Reilly and Roger Ailes: there's never been a trio more insulting to women or to journalism. Send a message to FOX. Turn off the "who do we hate today" channel. Turn off the "verifying facts prior to broadcast doesn't matter" channel. Turn off the "it's fine to pay millions to men who harass women and who in turn them pay the victims millions to keep their mouths shut" network. Turn off the "we have no regard for professional journalism" channel. Turn it off.